Once non-native species have spread, it is hard to tell where invasions started and what is helping them spread. 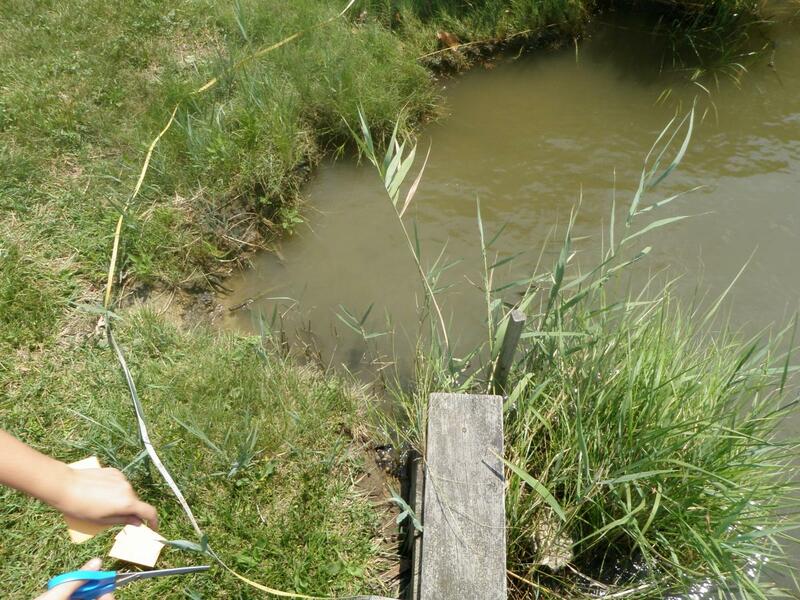 The goal of this project is to understand how anthropogenic land use and shoreline hardening affect the spread of the invasive wetland grass Phragmites australis. Phragmites often establishes on the edges of bulkheads or other shoreline hardening. What factors promote species invasions is usually unclear, especially when species invasions are not noticed until they have progressed to the point of covering significant amounts of habitat. Once non-native species have spread extensively, it is often hard to tell where invasions started and what is helping them spread. 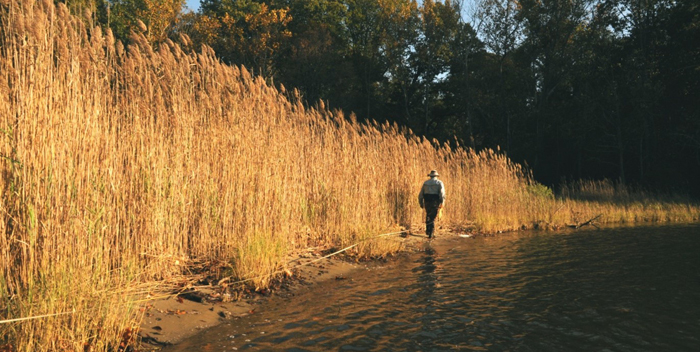 The non-native wetland grass Phragmites australis has now spread extensively throughout the Chesapeake Bay and in some subestuaries covers nearly 100% of wetlands, excluding the native plants that would otherwise grow there. But why are some subestuaries more extensively invaded than others and how does land use contribute to Phragmites invasion? Dennis Whigham measuring the length of a patch of Phragmites australis along the shoreline. A lot of different factors can contribute to how quickly newly formed Phragmites patches accumulate enough genetic variation to produce the abundant seeds that allow them to fuel further invasion. Having first discovered that Phragmites needs more than one genotype to produce seeds and that seeds fueled the explosive spread that led to Phragmites dominating many parts of the Chesapeake Bay, we interpreted the patterns of genetic variation within and among Phragmites patches to see how genetic variation relates to shoreline hardening. As part of the larger NOAA grant, we found that shoreline hardening affected the accumulation of multiple genotypes in Phragmites patches. We found that Phragmites patches along natural shorelines were made up of fewer genotypes than those along hardened shorelines. This suggested that shoreline hardening might promote seedling establishment, compared to unhardened shoreline. To provide additional evidence, we examined small, newly established Phragmites patches with SERC intern, Jared Stapp. We found that newly established Phragmites patches along hardened shorelines had been founded by more seeds than those along unhardened shorelines. This suggests that hardened shorelines promote Phragmites seed establishment and that patches that develop along hardened shorelines will quickly begin to produce seeds that will then found even more new patches.